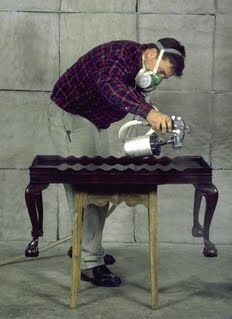 Furniture refinishing has been at the core of our business for over 30 years. From family heirloom antiques to dining sets that have simply lost their luster or perhaps simply a change in color to update your decor, Allison’s Furniture can strip and refinish any piece or set of furniture to better than new condition. First, our skilled craftsmen begin by carefully stripping your worn furniture of its original finish with an environmentally approved chemical stripper. Second, the furniture moves to our sanding and prep area. Only after a piece of furniture is hand sanded as to get every last bit of the remaining stain residue off of the wood and smoothed to exacting standards, is it ready for staining and finishing. The third stage is staining and color matching. It is at this stage where true artisan skill sets are utilized. Our expert finishers are well versed in matching any color or finish you would like, including distressing, faux finishes, glazing and painting. Upon completion of the staining process, the furniture is moved into our state-of-the-art finishing booths. A variety of top quality clear coatings are applied in a dust free environment assuring a smooth finish and protection to last years to come. See our finishing page for examples of the many types of finishes we offer.